Emirates today unveiled plans to increase capacity on the Dubai-Milan route with the deployment of a second daily A380. 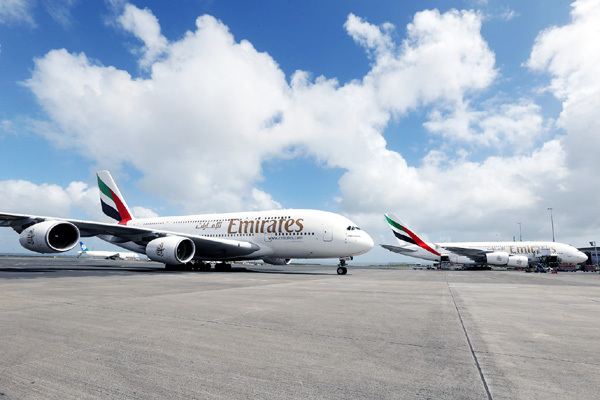 The migration from a Boeing 777-300ER to the iconic double decker represents a capacity increase of 1,834 seats per week between the two cities; enabling more A380 to A380 connections to and from key destinations in Australia, China, South Korea and South East Asia with just one stop in Dubai. Commencing October 1, 2016, Emirates flights EK91/92 will be operated by an Airbus A380 aircraft in a three-class configuration with 14 Private Suites in First Class, 76 flat-bed seats in Business Class and 401 comfortable seats in Economy Class. Passengers in all classes will enjoy access to free wi-fi and over 2,500 channels of films, TV shows, music and games, with an impressive selection in Italian, through ice Digital Widescreen, Emirates’ award-winning inflight entertainment system. They will also experience the famed hospitality of the airline’s multi-cultural cabin crew, with Italian speakers on all flights to and from Italy, as well as fine Italian wines and regionally inspired cuisine prepared using the finest ingredients. What’s more, First and Business Class passengers can travel to and from the airport in style with Emirates complimentary Chauffeur-drive service as well as enjoy Emirates exclusive lounges. Once onboard, passengers in premium class seating receive a luxurious amenity kit featuring Italian-made Bvlgari products and can enjoy the Emirates Onboard Lounge; First Class passengers can also take advantage of the Emirates Shower Spa to prepare for their arrival. At Milan Malpensa, Emirates offers an arrivals lounge where premium passengers can freshen up before being driven to their final destination. Emirates’ flight EK91 departs from Dubai at 15:45hrs and arrives in Milan at 20:30hrs. The outbound flight EK92 departs from Milan at 22:20hrs and arrives in Dubai at 06:25hrs the following day. The airline currently operates three daily services between Dubai and Milan, as well as a daily flight from Milan to New York JFK. From the airport, Emirates also enables seamless rail connections to over 700 train stations across Italy through its partnership with Trenitalia. The links between Milan and Emirates extend far beyond the airline’s triple daily service. Emirates has been a proud sponsor of AC Milan since 2010, with the current shirt sponsorship contract in place until the end of the 2019/20 season.